Great flavors in every bite. 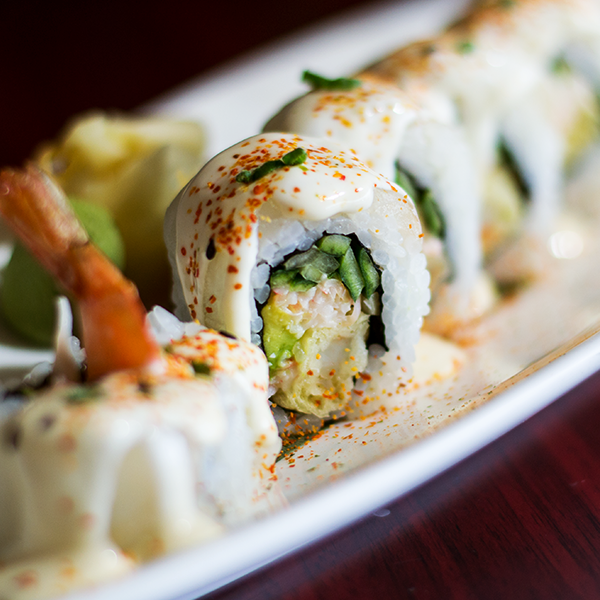 Crunchy Roll: Tempura coated rice, shrimp tempura, avocado, spicy mayonnaise, topped with eel sauce. Spider Roll: Deep fried soft-shell crab, masago, avocado, asparagus, cucumber, radish sprouts and yamagobo. Rainbow Roll: California roll topped with an assortment of fresh fish. Tuna, salmon, radish sprouts, avocado, chile sauce, wrapped in masago. Deluxe California Roll: California roll topped with extra crab, sesame seed, and eel sauce. Shrimp tempura, avocado, spicy mayonnaise, topped with eel, avocado, masago and eel sauce. Caterpillar Roll: Fresh water eel and cucumber roll, topped with avocado, layered in eel and wasabi sauce. Futomaki: Shrimp, crab, fresh water eel, tamago, masago, avocado, asparagus, radish sprouts, yama-gobo, gourd, and cucumber. Tuna, yellowtail, salmon, red snapper, mackerel, shrimp,octopus, and egg with cucumber or tuna roll. Assorted Sashimi on Rice: 3 tuna, yellowtail, salmon, red snapper, octopus, mackerel, albacore, shrimp, egg, masago, and vegetables. Salmon Lovers Ultimate Roll: Crab asparagus roll, topped with fresh norwegian salmon, avocado, with karpachio sauce (white wine sauce). Baked Dynamite Roll: Scallop, shrimp, and mushrooms-sáuteed and wrapped in seaweed, baked with special chili mayonnaise sauce. Spicy tuna, masago, asparagus, avocado, wrapped in soy paper (spicy). 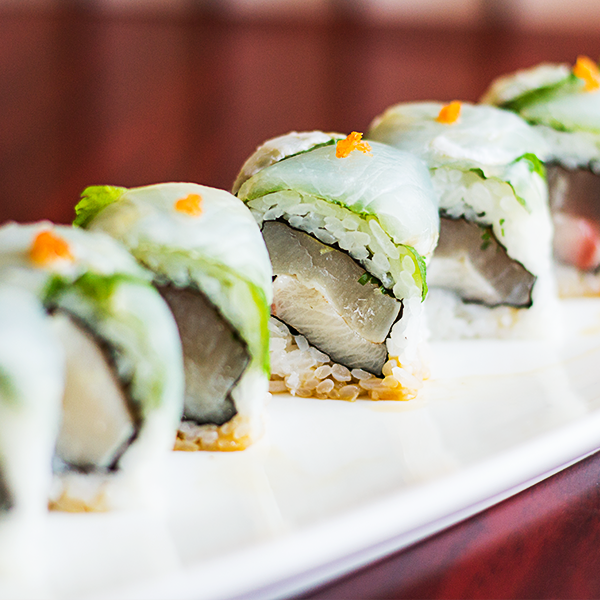 Seared albacore, yellowtail, ginger and scallions, inside a roll, topped with 4 slices of halibut, shiso leaf (green perilla), with ponzu sauce. Spicy tuna, spicy yellowtail, shrimp and albacore mix, seasoned in garlic and ginger, wrapped in soy paper (spicy). Salmon, cream cheese and avocado, wrapped in masago. Alaskan crab legs, osaki kanikama mixed with mayo and masago, cucumber and avocado. Shrimp tempura, spicy mayo, chili sauce, and avocado, wrapped with seared pep-pered tuna and avocado, served with ponzu sauce. Shrimp tempura, spicy mayo, chili sauce, and avocado, wrapped with seared albacore and avocado, served with ponzu sauce. Chunked tuna, masago, ogo, scallions, with sesame oil, chili oil, rock salt, wrapped in soy paper. 3 hand rolls - spicy tuna, california roll, and scallop roll. Shrimp tempura and avocado topped with tuna and special spicy mayonnaise, garlic, lime, and soy sauce (spicy). Shrimp tempura, crab mix, cucumber and avocado wrapped with halibut and topped with special cebiche sauce (spicy). Crispy deep fried sushi rice with spicy tuna and jalapeno. Avocado, carrot and asparagus tempura roll (vegetarian). Slur roll (crab, asparagus roll topped with fresh norwegian salmon) served with green spicy sauce (spicy).